A video that shows the light curve of the star described below evolving year to year. 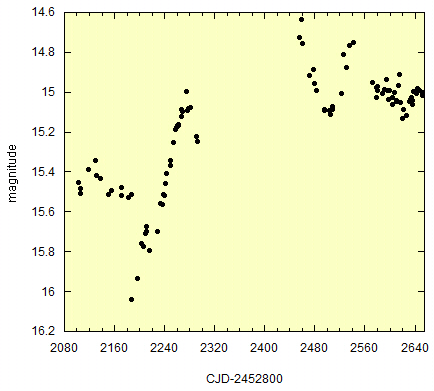 Most of our pulsating variable stars are red with periods between about 80 days and 400 days. Many have very long secondary periods of maybe thousands of days. One star is not as red as the others and has a significantly shorter period of variation, as might be more typical of, say, a Cepheid. Our best-fit period for this star is 14.898 days. 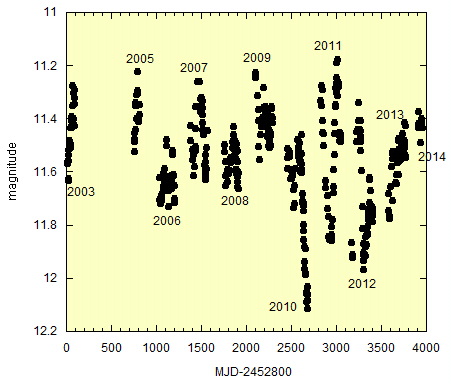 Shown below is a light curve from late summer 2010. The above light curve comes from a data-friendly stretch when we got 16 nights of data in 36 days. 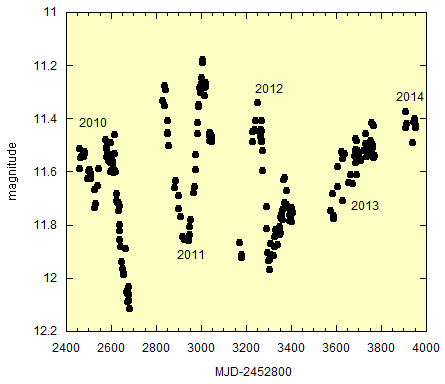 This light curve is evolving more strongly than most. Below is a phase diagram folded on the 14.898 day period. 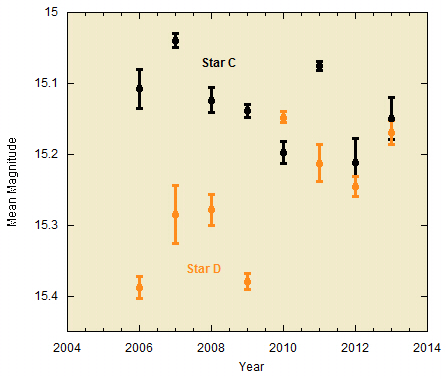 From 2003 to 2014 the amplitude of variation grew while the star got fainter on average. 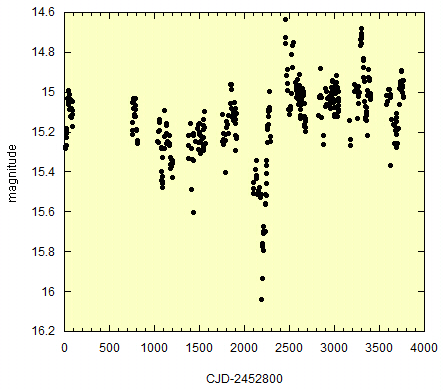 There is some evidence that the amplitude is getting smaller again - a very interesting star. 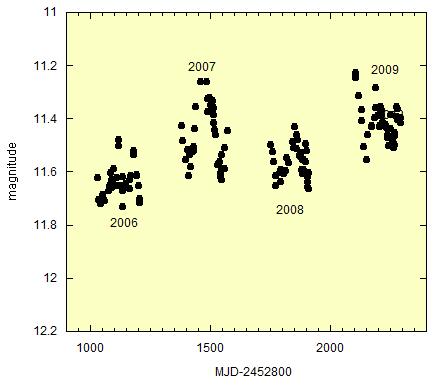 Above we see a light curve of a semi-regular variable star that shows a sudden increase of variability amplitude in 2010, when the amplitude more than doubled. 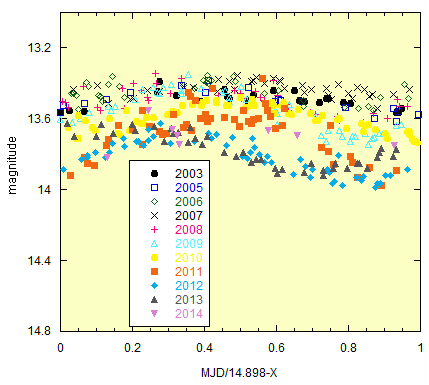 2013 into 2014 it appears that the star has settled back into low-amplitude mode. It should be noted that the 2014 data appear prior to passing photometric quality tests and some nights might be removed later. 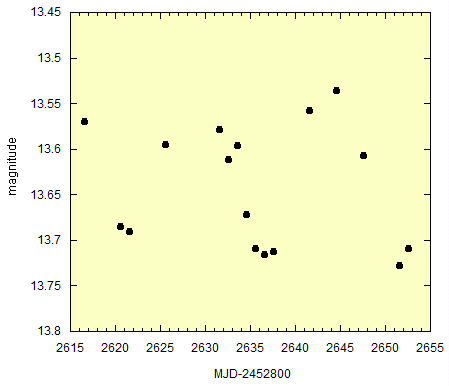 The pre-outburst and post-outburst sections of the light curve are shown in more detail below. In the section below we looked at changes in mean magnitude ("brightness") and amplitude for two semi-regular variable stars in our field. 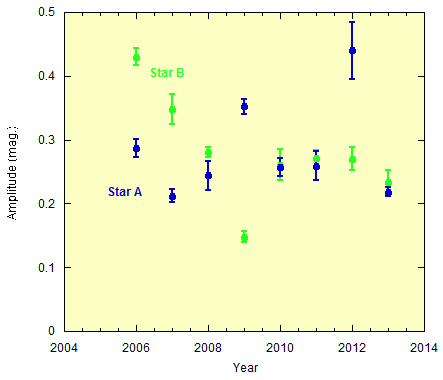 Above is an annual mean magnitude graph for two more stars. 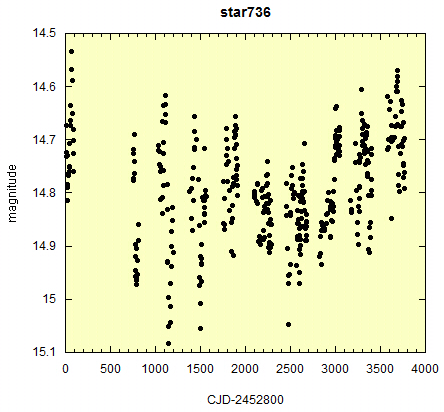 Star C is consistent with having gotten fainter and Star D looks to have brightened. We started down this path wondering if these SR stars are on average getting brighter or fainter as a group. With the four we have looked at oh so briefly here there is no suggestion of one or the other. We are also surprised by the size of the changes we have seen in these stars. Below is the graph of amplitude as a function of year for these stars. As with the stars in the next section the amplitudes are messier and harder to make any claims about. Another 20 to 40 stars have reasonable periods to do this work with. We shall see what arises. 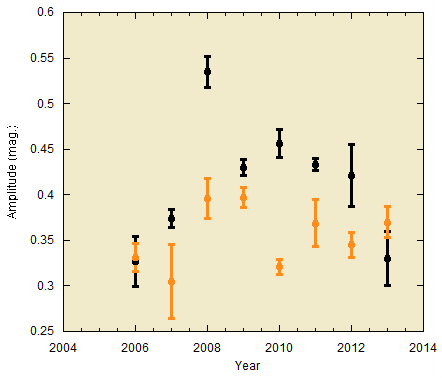 The mean magnitude of two semi-regular variables over each of the past 8 observing seasons. We look for evidence of long-term evolution in these systems. 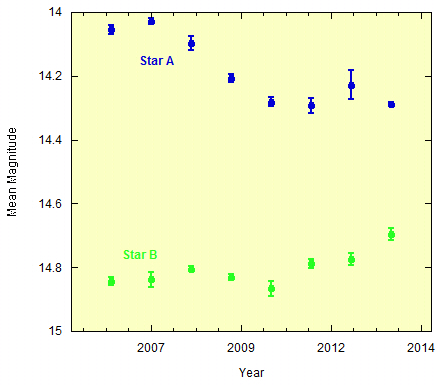 These two stars (of the ~60 SR stars in our study) show particularly large changes in these 8 years. Are the changes due to very long period oscillations? Are they related to equipment changes we made? The change in Star A is consistent with a single step down and the change in Star B is consistent withe a more recent step up. It is also possible that Star A is showing a steady decrease in light with oscillations around that decrease. To create these light curves we averaged (carefully due to uneven phase sampling) over shorter term variations of timescales 150 to 250 days or so. We are working on the questions raised here and more but it simply might require following these systems for another decade. The amplitudes of variation of these stars by year are shown in the figure below. Any change in amplitude is less clear although a case could be made for a meaningful decrease in the amplitude of Star B. A multi-periodic semi-regular variable that shows an apparent decrease in amplitude and a change in mean magnitude over the past decade. One question we are trying to answer is if such changes have been common and of similar sign for the 60 or so semi-regulars in our field and whether these changes are monotonic or cyclic. Some of our variable stars show sudden "pulses" in signal variation and then settle back into relatively low amplitude variations. How common are these pulses? What are these pulses? Below is a "close up" of the time around the pulse.